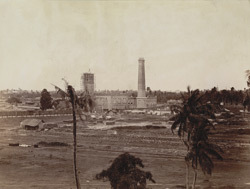 Photograph taken in 1890 by an unknown photographer showing the hydraulic engine house at Kidderpore Docks. Hydraulic power was produced to move cranes and to drain the graving docks (dry docks), where ships repairs were carried out. The pumping engine house, here seen in the course of construction, stands between the two docks at the north-east corner of the tidal basin. On the east side of the tidal basin, space had been allowed for the construction of two graving docks, one 520 ft long with a 70 ft entrance and another 375 ft long and 60 ft wide. In 1891-92, the new graving dock was completed and the first vessel, a Royal Indian Marine boat "Mayo", was admitted into it.